The most significant cause of land degradation in India is water erosion. It has amounted to loss of 10.98% and 10.83% of total land lost in the period of 2011-2013 and 2003-05, respectively (Desertification and Land degradation Atlas of India, ISRO). Water erosion here, does not include the natural erosion caused by rivers. Rather, it is the erosion caused directly by (or as a consequence of) human activities. Water erosion is the removal of topsoil (up to 20 cm of soil) due to the action of water. It is further divided into 3 types based on increasing severity. 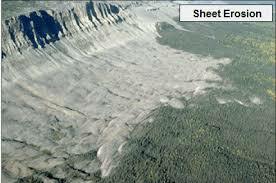 The initial stages of erosion are called sheet erosion, where water moves horizontally over a large area. The next stage is rill erosion, where small incisions take place as the water begins to collect along parts of the land at lower elevation (or weaker soil). It results in the formation of rills and narrow, shallow gullies. 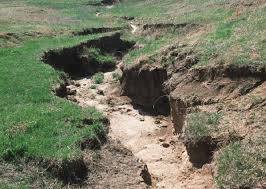 The last stage happens when these gullies widen and deepen, causing gully erosion. 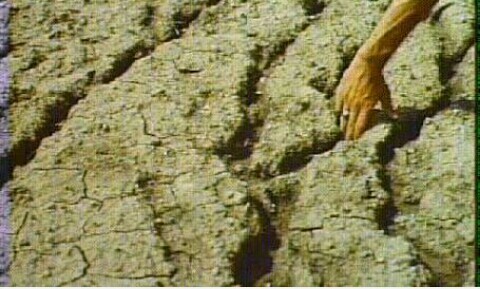 This is the most severe stage of erosion because entire sections of the soil can be washed off in a short time. With respect to land degradation, though, sheet erosion has caused the most damage because it can cover a large area. It is most common in agricultural fields, due to improper agricultural practices. Does water erosion happen in isolation? Very rarely. Water erosion is generally a consequence of other practices like deforestation, over-irrigation, large scale crop plantation, etc. These practices produce conditions that allow water to wash away soil easily. For example, removal of trees with deep roots removes the agent that is binding the soil together. When this binding agent is removed, it makes the soil lose and susceptible to being washed off. Likewise, improper agricultural practices are also a major cause of water erosion. The big deal with the loss of soil is that it is essentially a non-renewable resource. That’s right! Do you know how long it takes for 3 cm of soil to develop? 1000 years! When you take this into consideration, soil erosion is a BIG problem because we have lost 33-40% of the world’s topsoil, according to Food and Agricultural Organization (FAO). At this rate, according to an article published by Scientific American, farming can only continue for the next 60 years. We are losing 3 football (soccer) fields of topsoil every minute, says Volkert Engelsman, an activist with the International Federation of Organic Agriculture Movements. What are the other effects of water erosion? Water is the most powerful force of nature. There are few agents that can stop a body of water rampaging across a landscape. A few grains of soil are nothing. Any form of erosion has the ability to remove huge amounts of soil. Apart from the loss of topsoil, water erosion can severely degrade/kill the crops and natural vegetation growing in an area. It can also prevent seeds from germinating. Organic matter and any form of manure are also carried off. But the effects are not limited to the site of erosion. Off-site, the soil carried by the water is dumped in low elevation areas. There, it buries the existing seedlings, necessitating replanting. It could clog natural waterways and lead to unnatural shifting of streams. It can damage fish habitat and degrade the downstream water quality. All of these effects mean one thing: Land degradation.